Add your own captions to "Moronus" in the text box below. Elder Packer must have died and this is the Lord's way of telling us that gays and lesbians in the temple are okay now. Daniel C Peterson finally prevailed upon the Brethren to formally acknowledge the existence of a Second Hill Cumorah in Southern Mexico. The second Moroni is a symbol of this news. John Welch of FARMS immediately extrapolated that beccause there are three spires on the east face of the Salt Lake Temple, there must of course be a third Hill Cumorah somewhere else, such as Thailand. Welch ejaculated, "I feel a chiasm coming on!" as he became so excited and aroused by the glorious news. Welch immediately set sail from the tip of Saudi Arabia in a waterproof handcart paddle craft - tight like unto a dish, in hope of discovering the third hill. From the AP Wire: In the interest of furthering efforts to mainstream the Church of Jesus Christ of Latter Day Saints, church leader Gordon B. Hinckley announced that LDS scripture and doctrine would be revised to reflect co-equal status between the Angels Moroni and Gabriel. Church architecture will shortly be modified to reflect the change, he added. The LDS prophet further counseled that while members shouldn't take this as a certain sign the Second Coming of Christ was imminent, they should follow the leadership and always have themselves prepared for this possibility. East facing Moroni: I am facing East so that when Christ returns I can blow my horn to announce the wonderful news! Why are you facing West? West facing Moroni: So that I can blow my horn when customers return to shop at the City Creek Mall. Due to rising use of instant messaging and text messaging via wireless Internet connections and mobile phones and other wireless devices, the LDS church has jumped on the communication bandwagon. Instead of discouraging use of this messaging technology, they have developed their own mobile devices complete with filtering software and parental locks to ensure that only language appropriate for within the Lord's house will be displayed or heard. This new LDS phone and messaging device is designed in the shape of Moroni's horn as a reminder for us to oft speak kind words to each another so we will be worthy to communicate with the Lord through the veil in preparation for the Second Coming. The second Moroni atop the SLC temple tower is a trick. It is an illusion by Criss Angel, created via smoke and mirrors, and commissioned by the Corporaton of the President. 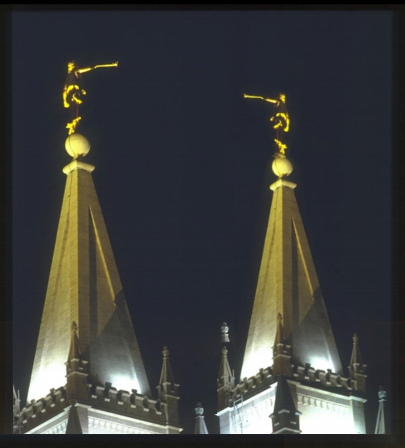 From the AP Wire: Finding themselves somewhat at odds with Gordon B. Hinckley's televised re-interpretations of Mormon doctrine, The Quorum of the Twelve has mounted a second Moroni atop the Salt Lake Temple. Loudspeakers have been installed inside the heads of each Moroni sculpture, with the statues' trumpets magnifying the sound. The Quorum has explained this action in the following press release, delivered today by Boyd K. Packer: "The Church has magnified its attempts to reach out to as many of the faithful as possible. Some recent changes in doctrine, as expressed by President Hinckley, have offended some members and caused them to question their dedication to obeying the commandments of the Lord. Different devotional messages will be broadcast from the East Moroni and from the West Moroni, so that the obedient body of faithful members can be magnified." Dallin Oaks added that the idea for the project was suggested by the prominent BYU Professor and Islamic Scholar Daniel C. Peterson, who described the Islamic practice of a mueddin calling the faithful to prayer from the top of a minaret. "We already had the minarets, we just added the mueddins," Oaks said.